Video games are not the only military training tools that use virtual reality. The U.S. armed forces spends about $4 billion a year on training equipment and programs involving simulations, and many of these feature some degree of VR. Simulations help soldiers learn how to use complex equipment, work together, and rehearse missions. They let commanders plan battles and try out different combat tactics, maneuvering platoons of virtual soldiers, vehicles, and weapons over thousands of square miles of terrain. "The shift from live range training to computer-based training is fundamentally changing the way we prepare our soldiers for the future," 10 says W.H. ("Dell") Lunceford Jr., director of the Army Model and Simulation Office in Arlington, Virginia. A task force of the U.S. Defense Science Board concluded in a report in 2000 that low U.S. casualties in military actions in the 1990s was due in large part to the use of simulators in training and planning. Virtual reality games like America's Army (pictured) can be helpful military training and recruiting tools. .
Commercial pilots today train on virtual reality flight simulators like this one. Simulation reduces the risks and time of actual training. simulators can never completely replace actual flight experience because, for instance, they cannot show all the things that can happen to a plane in bad weather. Some types of aircraft, especially helicopters, are also hard to simulate accurately. 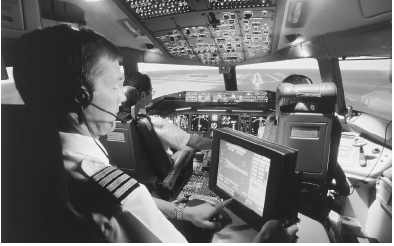 Still, even relatively simple simulator programs that run on home computers have proved very useful in training pilots. A navy study found that student pilots who used Microsoft's Flight Simulator program were 54 percent more likely to obtain above-average scores in real flight tests than pilots who had trained without the program. Like the military and the air industry, large businesses are starting to see VR as the best way to teach workers how to do jobs that are complex, dangerous, or both. VR training programs are not yet widespread because they are expensive to develop, but they can save companies money in the long run by cutting down on the amount of costly real equipment, such as heavy machinery, that must be used in training. Simulation programs also reduce risk to machines, the environment, and even human lives. Finally, the computers that run the programs can be set up to keep records of the students' actions, giving teachers, students, and researchers an opportunity for review that live training cannot offer. Some companies use driving simulators in much the same way that airlines use flight simulators. These simulators are too expensive for ordinary driver training, but corporations such as Amoco (American Oil Company) employ them to teach truck drivers to handle icy roads and other hazards. Some drivers of police cars, fire trucks, and ambulances also use simulators to learn how to travel safely at high speeds. Virtual reality is also being used or tested as a training tool for other hazardous jobs. Fifth Dimension Technologies in Santa Clara, California, for instance, has developed simulators that teach people to use hauling trucks, electric shovels, and other machines in mines. One of their programs, the Integrated Virtual Mine, connects simulators representing different kinds of machines so that trainees can learn to work as a team. 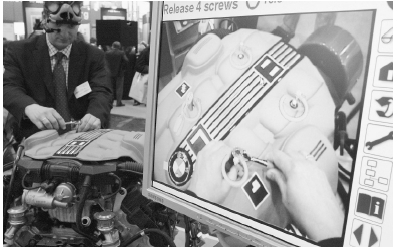 An inventor demonstrates a simulation program designed to train engine mechanics. Simulators provide safe yet realistic training conditions. systems fail, and deal with angry passengers. 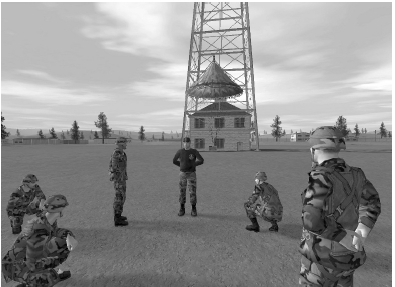 It presents simulated situations to which the employees respond, taking on the roles of characters in each situation. The instructor discusses their reactions, pausing or replaying the scenarios as needed. Doctors, ranging from future physicians still in medical school to experienced surgeons, also increasingly do part of their learning in virtual reality. Rather than studying anatomy (the structure of the body) by cutting up corpses of animals or of people who have donated their bodies to science, students at some medical schools now use virtual reality programs based on pictures from CT (computerized tomography), MRI (magnetic resonance imaging), and other medical imaging technology. The programs let the students see organs and body parts in three dimensions, examine them from any angle, and make virtual cuts into or even "fly through" them. They can repeat the process as often as they need to, whereas a real dead body can be dissected only once. Some of the best anatomy programs owe their existence partly to a convicted murderer. They are based on the National Library of Medicine's Visible Human project, which used X-ray scans, CT scans, and MRI scans to make three-dimensional maps of real male and female bodies. The male body belonged to Joseph Paul Jernigan, who donated it to science before he was executed for his crimes in 1993. Other VR programs let medical students and nurses practice opening veins to draw blood or inserting tubes called catheters into body openings before they ever touch a living patient. Force-feedback gloves such as CyberGrasp give the students a literal "feel" for the textures of different tissues and the amount of resistance a surgeon would meet while cutting into them. 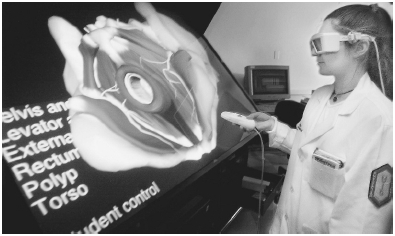 Experienced surgeons also use VR to learn and to practice complex techniques for operating on the heart and the brain. Studies have shown that training with simulators improves surgeons' skill in carrying out real operations. Some psychiatrists are using virtual reality to learn more about the bizarre worlds inside their patients' minds. A five-minute program called "The Bus Ride," demonstrated at American Psychiatric Association conventions in 2002 and 2003, shows an ordinary public transit trip as it might appear to a person with schizophrenia, a severe mental illness. The program, presented on a wraparound video screen inside a simulated bus, is based on reports from real people with schizophrenia and psychiatrists who have treated them. It features distorting hallucinations and voices that exist only in the patient's imagination. "It can help doctors understand what a patient goes through," 13 says Daniel Frey, who has the illness. VR programs now train medical students in anatomy and surgery, and can even help psychiatrists enter the world of the mentally ill. Virtual reality is one of many forms of computer technology that schools have begun to use often in the last decade. The U.S. Department of Education reported in late 2003 that about 90 percent of people aged five to seventeen use computers, mostly at school but also in libraries or at home. Students gather information from the World Wide Web for reports or use e-mail and chat rooms to work on projects with other students in distant parts of the country or the world. Sometimes they post the finished projects on Web sites of their own. Some students take complete classes online from "virtual schools." Schools can seldom afford fully immersive virtual reality, but they often use programs that at least provide three-dimensional graphics and interactivity. These programs run on standard computers. Some require free downloadable programs or inexpensive gear such as shutter glasses, but many need no additional software or equipment. One example of a school virtual reality program is called Touch the Sky—Touch the Universe. It uses an interactive 3-D model of the solar system to help students learn about astronomy. Students fly a virtual spaceship through the model, looking at it from different viewpoints. They watch eclipses and changes of phase as the planets and moons move through their orbits. They can zoom in on individual planets, moons, asteroids, and comets to study them more closely. When they touch a planet or other astronomical object with the mouse pointer, the program shows information about the object, such as its size and the time it takes to complete its orbit. Students can speed up or slow down the movement of the system and find out how these changes affect the movement of particular planets or moons. Another educational virtual reality program, made by a company called Sunrise VR, teaches architecture "in its [natural] element—earth, sea, and sky." 17 Named Virtual Chicago, this program lets students follow the development of modern architecture by flying over Chicago and exploring more than forty of the city's buildings. The program's developers say they chose Chicago because that city is "a living museum of architecture," 18 housing the world's first skyscraper and other unusual buildings. The program includes an introduction to architecture throughout history, a description of modern architectural movements and famous architects, examples of different architectural forms and styles, and a demonstration showing how a skyscraper is built. Students can create their own virtual reality projects with the Virtual Reality Development Lab, a kit of hardware, software, and instructions sold by Digital Technology Frontier in Phoenix, Arizona. They photograph a site with a digital camera included with the lab, then use the lab's computer and software to "stitch" the photos together into panoramas—images that show the site as it would look if a viewer stood inside it and turned in a complete circle. They combine multiple panoramas with audio and links to text or still pictures to develop a VR tour of the site. The tour can be viewed with glasses included in the kit. It can also be posted on the Web to share with other students. Some VR programs help students with special needs. For instance, a company named Veridian created a program called Virtual Reality Education for Assisted Learning, which helps students with severe hearing impairment learn life skills such as how to cross a street safely. Another program gives disabled students practice in finding their way around schools and other common environments. An experimental program developed in Britain teaches social skills to people with autism, a brain disorder that makes learning how to get along with others difficult. Other programs, some available commercially on CDs and others appearing for free on Web sites, let people learn about the world by paying virtual visits to distant places. Many virtual tours feature panoramic views through which a visitor can turn by using a mouse. Some panoramas also allow the viewer to look up and down, as if standing in a cube or a bubble, and to zoom in on particular parts of the panorama. Clicking on certain spots in the panorama may take the viewer to other panoramas, still photos, or text information about those spots. One Web site of this type, created by Peter Danford, is called the Tibet Game. In addition to providing a panoramic view of Lhasa, the capital of Tibet, the site lets viewers interact with characters on the screen, buy objects such as prayer flags, and give away pictures of the Dalai Lama (Tibet's spiritual leader), with the aim of gaining enough "karma" to "enter nirvana." Danford has also created virtual tours of the Great Wall of China, a Hong Kong voyage, the Shanghai acrobats, and more, and posted them on free sites on the Web. Tourist boards of cities and countries provide other virtual tours, such as the one of the world-famous opera house in Sydney, Australia. Travel businesses like Disney Cruises also sometimes offer virtual tours of their rooms or the places they visit. Perhaps the most "far out" tour of all is NASA's Virtual Astronaut, a Web site aimed at students in grades five through eight which includes panoramic views of the Space Station and a host of related learning activities. In addition to tours on Web sites, some art and science museums use virtual reality to educate people who visit them in person. The Hayden Planetarium at the American Museum of Natural History in New York City, for instance, has an on-site show that lets viewers fly through a 3-D representation of thousands of stars. Museum astrophysicist Michael M. Shara calls it "the CAVE gone wild." 19 The simulation, based on data from satellite telescopes, is so accurate that, after the museum closes, Shara and fellow astrophysicist Jarrod R. Hurley use it to test their theories about the movement of star clusters. Watching the stars move on the planetarium dome, they have seen features of the clusters' behavior that they had never noticed when looking at their data on ordinary computer monitors. As with other uses of computers in learning, experts disagree about how useful virtual reality programs for education and training really are. Some praise such programs for extending the range of materials and learning experiences that students can have. They say that VR makes study material more exciting, so students will be more likely to remember what they learn. Expensive as VR programs are to develop, supporters also claim that creating or buying these programs may be cheaper in the long run than maintaining laboratories in which students do live experiments or letting adult trainees use real machinery. On the other hand, Edwin J. Delattre, dean of the School of Education and professor of philosophy in the College of Arts and Sciences at Boston University, writes, "Learning how to behave properly in a classroom, a museum, or a library, and acquiring the sense of respect and, at times, of reverence and awe that befits us in such places cannot be accomplished in virtual reality." 20 He and other critics fear that students who rely too much on virtual reality and other computer programs will miss the personal contact and the lessons about social interaction that a face-to-face classroom can teach. Critics of educational and travel VR programs also say that these programs, no matter how well done, can never have the impact of an actual visit to a museum, park, or historical site. Similarly, people who question the value of VR training programs say that because such programs cannot completely simulate the behavior of machines or people, they cannot be as effective as on-the-job experience. Because virtual reality programs for training and education, like other VR programs, are still fairly limited, even most of their supporters agree that for the foreseeable future, they most likely will—and should—be used as additions to traditional classrooms or standard training methods rather than as replacements for them. I'm a pre med student and I found the 'Virtual Bodies and Minds' portion of your article to be very interesting. Could I possibly get the name of the program being described in the first paragraph of the section? Thanks. I also found the "Virtual Bodies and Minds" portions to be fascinating. I would like to know the name of the program and where I can purchase this type of virtual reality program. Thanks. How I wish I have money to buy or have these gadgets and learn this technology to teach my students all over the world. Gamified education is actualy our future. It's most simple way to engage students, also - develop their practical skills. Strongly suggest to try out Virtonomics. I am a PhD student proposing to work on the effectiveness of offline virtual reality for teaching electrical and electronic courses in Nigerian universities. Please I need help in the development of appropriate software for this study. Kindly help me.